Funny story. My husband has a good friend at work and they usually eat lunch together. The other day Derek took 2 sandwiches to work. The first time he has done that since he started his job a couple months ago. Well lunch comes and his friend, Trevor, also had brought 2 sandwiches! ha So they end up switching a sandwich with each other. Then the next day Derek takes this taco soup for lunch. I haven’t made taco soup since we’ve been married. Derek says soup twice a year is good enough for him. Well, guess what Trevor had brought for lunch? Taco soup! ha I think that is so funny and so random! This soup is so good! I had a recipe for taco soup from my freshman year but don’t ask me why I didn’t write down measurements or instructions. I searched for a recipe and found this one on Our Best Bites. It had all my same ingredients plus directions for the crock-pot and directions for freezing. I ended up using the crock pot and it was great. Derek’s family all loved this soup and kept telling me how much they liked it. The best part is it was so easy to make! It does make it a lot so if you have a small family and don’t want a lot of leftovers half the recipe. The only change I have made to the recipe is adding a can of green chilies. I LOVE green chilies. Toppings: Pico de Gallo, light sour cream, shredded cheese, crushed tortilla chips, tortilla strips, guacamole, etc. Heat a large soup pot over medium. When ready, brown the ground beef with the onion and garlic. When almost brown, add the taco seasoning and 1 c. water. Add the remaining ingredients, including the remaining 2 c. water, bring to a medium boil, then, cover and reduce heat. Simmer for at least 15 minutes. Serve with desired toppings. Makes 10 12-oz. servings. Slow Cooker Instructions: After browning the meat, place all the ingredients into a slow cooker and cook on low for about 6-8 hours. Freezer Instructions: Because of all the canned goods, you’ll just take up a lot of space in your freezer if you freeze the whole recipe. However, after it’s been cooked, the leftovers freeze extremely well. You can even try freezing individual portions in 12-oz. freezer-safe containers and then reheating them for a quick lunch. We typically put corn in ours for another serving of vegetables. We’ll also mix things up with black beans every once in a while. 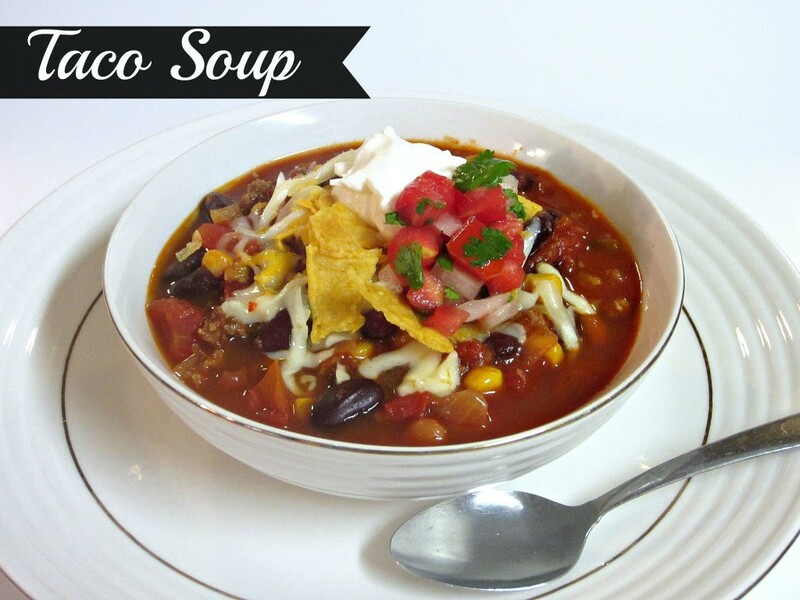 Taco soup is one of our favorite meals! I do have corn listed in the ingredients for the taco soup.